Investigators for the state’s political watchdog agency have concluded that former Peralta colleges trustee Marcie Hodge violated election laws during her campaign for mayor of Oakland in 2010. Gary Winuk, chief of enforcement for the California Fair Political Practices Commission (FPPC), also stated in public records filed with the FPPC that Hodge and her mother, Yvonne Hodge, admitted to violating the law and agreed to pay fines totaling $5,000 to the state. The state’s investigation was prompted by news reports (presumably by the Express and other news media) that Hodge had repeatedly failed to disclose her donors prior to the 2010 November election. The Express published several reports about Hodge’s actions during and after the mayoral campaign. Under a stipulated agreement, Marcie and Yvonne Hodge, who was Marcie’s campaign treasurer, have agreed to pay the $5,000 penalty for failing to disclose her donors and her campaign expenditures during the 2010 mayor’s race in violation of state law. As the Express has reported, Hodge has a history of failing to disclose her campaign reports as the law requires. 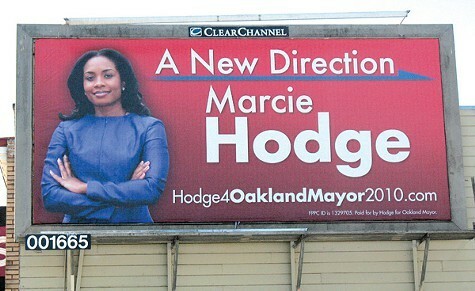 Hodge’ actions also led to widespread speculation during the 2010 campaign about who was funding her race for mayor, particularly after her campaign had paid for numerous billboards in the city and for other expensive advertising. After the election was over, and Hodge had finished fifth with 3 percent of the vote, she disclosed that she had provided the majority of funds for her campaign. However, the source of that money remains a mystery: Hodge reported prior to the election on her statement of economic interests of having no job or income that generated more than $500 a year. During the election, Hodge sued the Express for libel, but a judge later dismissed her suit in its entirety, ruling that it was without merit. The FPPC is scheduled to take up Hodge’s stipulation agreement on April 25.